You get the idea - not only am I a sucker for truly awesome post-apocalyptic movies, but I am a sucker for the rash of Italian exploitation copies that proliferated in the wake of George Millers Australian after-the-bomb nightmare. After watching Mad Max 2 many many times in 1983, I was inspired to create my own version of post-apocalyptic fiction, as a comic strip, on reams of A4 paper and illustrated in black biro. 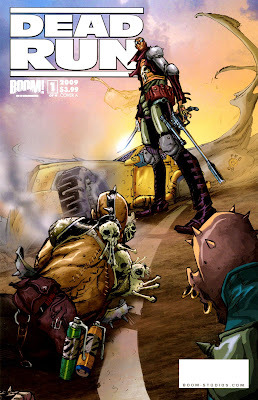 'Uruz', as the comic was known, was the adventures of the titular hero as he wandered a bleak post-apocalyptic desert. Saving people. Killing baddies. In a desert, full of big customised cars etc. One guy delivering a package across a ravaged and extremely dangerous post nuclear landscape? Thats 'Damnation Alley' and 'The Cursed Earth' influence right there. "Over my dead and rotting corpse. Nobody drives my ride but me." Nick Masters is a 'courier' - he delivers whatever, wherever in this dangerous new world. He lost a drug consignment that belonged to a 'Mr Big' called Kane (well what did you expect - Gerald? Kevin?). Kane has kidnapped Masters Sister, and in order to get her back safe, has to make a 'Dead Run', with a consignment of whatever it is that Kane wants him to courier. Joined by a girl whose Father was a courier who made the 'dead run', they set off. Thats it in a nutshell. Channeling all that is good and daft about the genre, 'Dead Run' holds a lot of promise for its limited life (its due a 5 issue *ahem* run). Verdict - trashy post-apocalyptic nonsense. Generic storyline, cheesy dialogue, a literal cliffhanger at the death. It gets my vote! 7.75 out of 10.